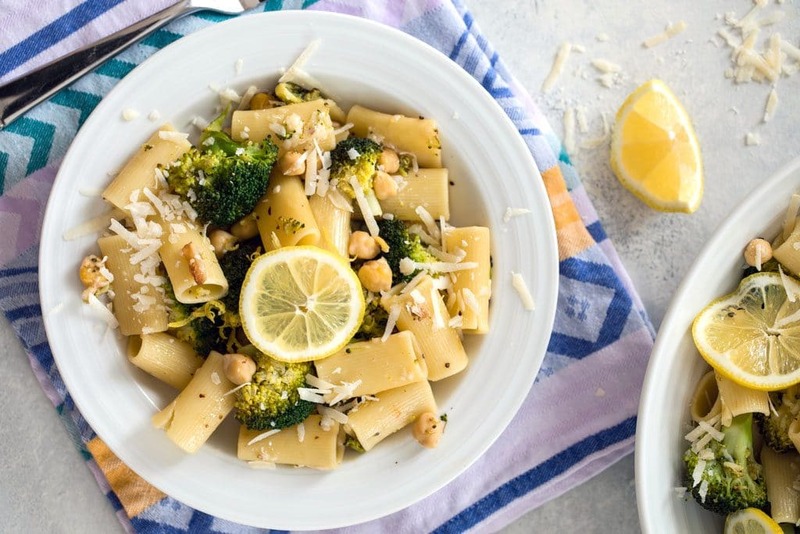 This Lemon Broccoli and Chickpea Rigatoni is the perfect busy weekend or Meatless Monday recipe, but it’s also stunning enough to serve as a side dish at a dinner party. 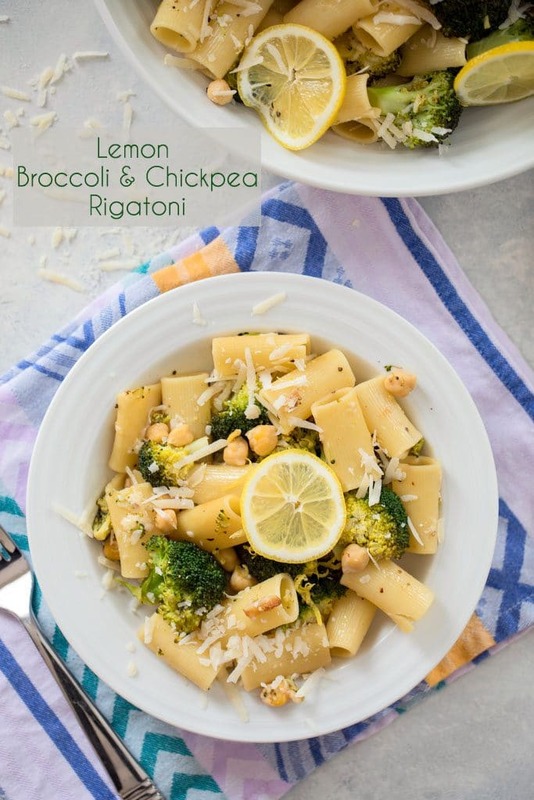 (This recipe for Lemon Broccoli and Chickpea Rigatoni was originally posted in June 2010, but was updated with new photos and content in 2018). Sometimes the best dishes are the most basic. And I don’t mean the 2016 definition of basic. I mean the old-fashioned meaning of basic. 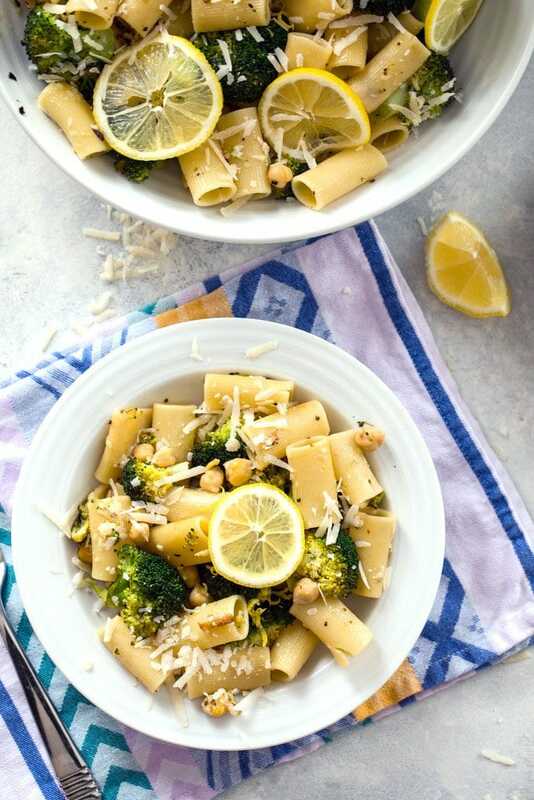 Standard, regular ingredients that don’t scream “we’re special!” This Lemon Broccoli and Chickpea Rigatoni, adapted from Food & Wine, is made with a short list of simple ingredients that join together to create a dish packed with flavor. It’s also the perfect dish to serve for when you’re having a couple guests over and don’t have a lot of time to spend in the kitchen and don’t want to make a big fuss. You can be in and out of the grocery store pretty quickly and I’m willing to bet you already have several of the ingredients in your pantry. Just be sure to pick up a bottle of white wine because it will complement the flavors of this pasta and the lemon broccoli perfectly. I don’t cook with chickpeas nearly enough, but I love that they can help boost the protein in so many meatless dishes. This recipe requires you to let them rest in a little bit of olive oil before adding them to the dish. I’m down with that. I’m also down with lots of fresh broccoli and crispy garlic. Plus, some red hot pepper flakes and rigatoni, which is a pasta I don’t cook with nearly enough. Mmmm, lemon and garlic overload in a light cheesy sauce 🙂 The base of this dish is so versatile which makes it easy to customize it to your taste and add other ingredients. If you wanted to bulk it up some more you could add some thinly sliced chicken, but if you’re up for a meatless dish, this is totally satisfying as is. Sometimes I feel a little guilty about eating a big bowl of pasta for dinner, but all of that broccoli eases my guilty conscious quite a bit. Plus, garlic has tons of health benefits and if you’re like me, you’ll find yourself picking out the crispy garlic bits from this dish and going to town on them. Like I mentioned, this makes a fabulous casual weeknight dinner with friends, but I think it’s also glamorous enough to be served as a side dish at a dinner party. It’s simple, but stunning. If you’re making it simply as a dinner for two, be ready for lots of leftovers! Which is never ever a bad thing. Take them to work or have them for dinner the next night. And potentially the night after that, too. As far as simple pasta dishes go, this one is a clear winner. I did make a few alterations in ingredient amounts from the original recipe, but stayed mainly true to it. 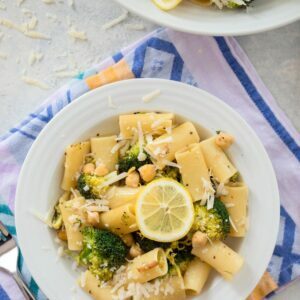 The flavors of lemon broccoli go so well in many different dishes, but are absolute perfection with rigatoni pasta and chickpeas. This is a dish you’ll likely want to make again and again! This Lemon Broccoli and Chickpea Rigatoni is the perfect busy weekend or Meatless Monday recipe, but it's also stunning enough to serve as a side dish at a dinner party. 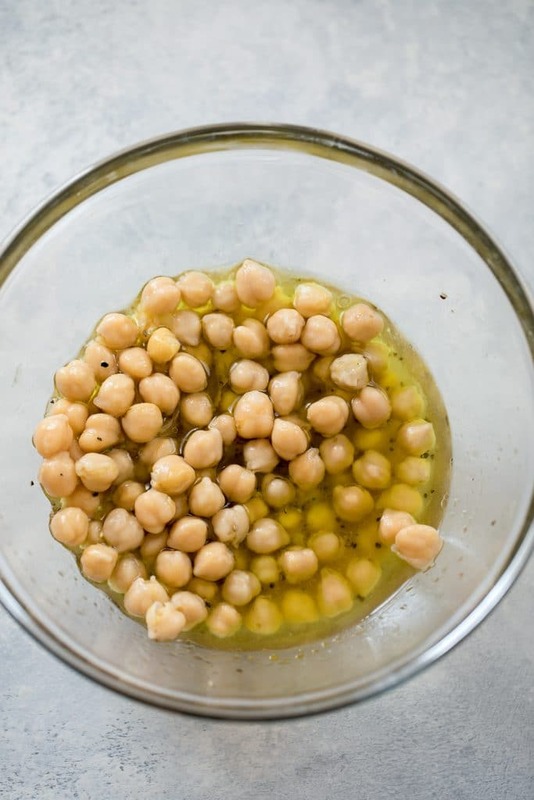 In a medium bowl, toss chickpeas with lemon juice and 1/2 cup of olive oil. Season with salt and pepper. In a large pot of boiling salted water, cook the broccoli until crisp, about 4 minutes. With a slotted spoon, transfer broccoli to colander and rinse under cold water to stop cooking. Add rigatoni to the boiling water and cook until al dente. While pasta is cooking, heat the remaining olive oil in a large skillet and add garlic and crushed red pepper. Cook over moderate heat until garlic is golden, about 3 minutes. Add broccoli and cook until tender, about 5 minutes. Add the chickpea mix and cook until warmed through, about 1 minute. Drain the pasta and reserve about 1/4 cup of the cooking water. 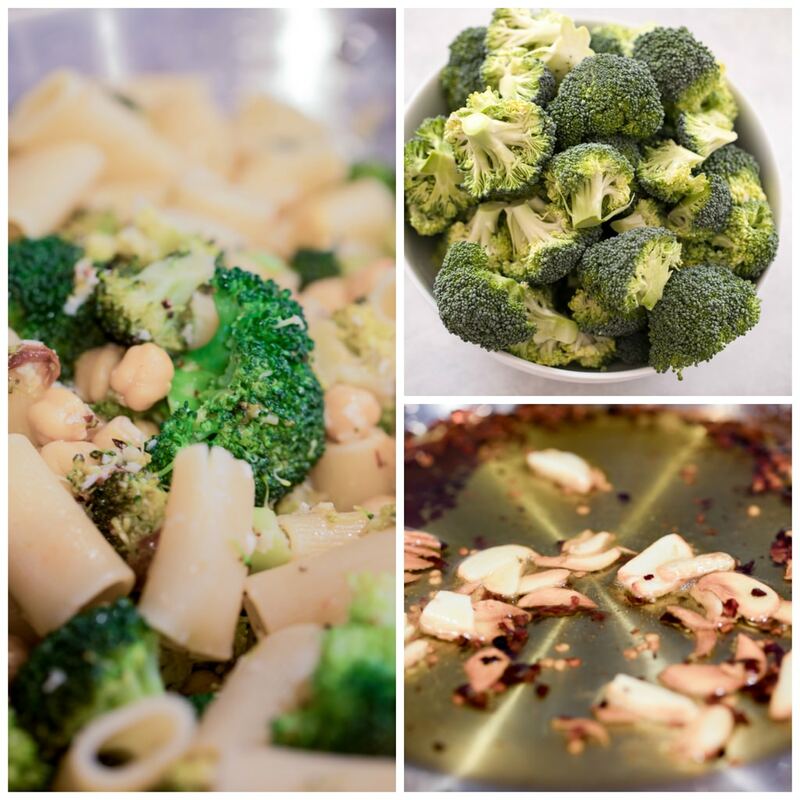 Add pasta to broccoli and chickpeas along with the reserved water and season with salt and pepper. Cook over moderate heat, making sure to stir until the rigatoni is evenly coated with sauce. Remove the pan from heat and stir in 1/2 cup of the Parmesan cheese. Transfer the pasta to plates and serve, sprinkle with the remaining Parmesan. Serve garnished with thinly sliced lemon rounds, if desired. 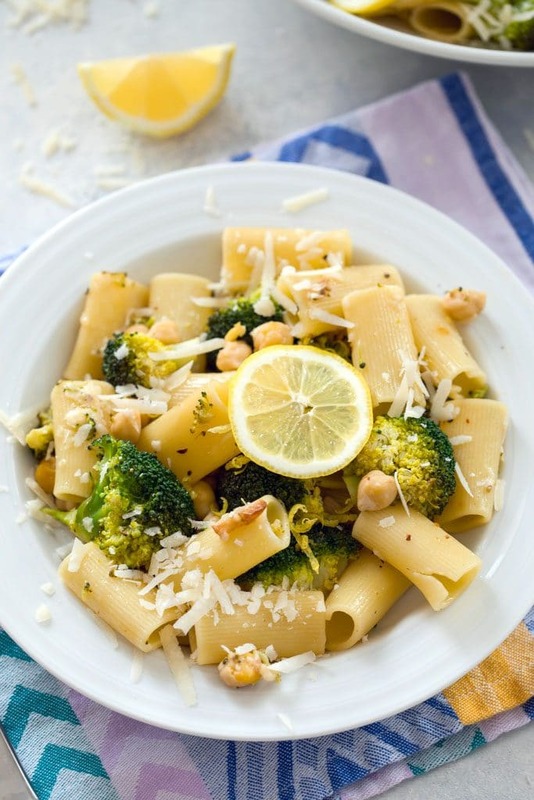 17 Responses to "Lemon Broccoli and Chickpea Rigatoni"
Mmmm that sounds delicious! I wonder how it would be with roasted chickpeas? They’d be like crunchy croutons! Lemon and chickpeas are 2 of my favorites. Looks so good! Looks so good – pasta is my go to for quick and easy dinners – I’ll definitely have to try out this recipe :). I just might make this for dinner tonight. This looks simple and tasty! I love the combination of pasta and chickpeas! Great, vegetarian meal that sounds really tasty. Will have to give this a try. oh this looks great-I’ve never looked there for recipes! Great idea! i made this last night but i used peas instead of broccoli because i was too lazy to go to the store and man was it good. seriously this recipe is so delicious i can’t wait to eat my leftovers! This is my favorite kind of pasta dish to make! I love cooking with chickpeas also! What a lovely dinner in 30 min! I love that it’s vegetarian, but still bursting with flavour and iron from the broccoli and chickpeas.